No goodbyes today. Instead, I present 4 WIPs that were picked up and finished this week! They were targeted for their cuteness and proximity to completion. 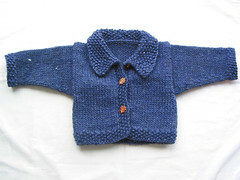 Blueberry Fields needed sleeves and finishing; the three Flax Jax's just needed buttons (how lame is that?). This brings me down to 50 projects. I'm thrilled! I still need to halve that to reach my goal... [deep breaths] We'll get there. Notes: This pattern was my opportunity to use up an oddball of Mezzotint and make one of those raglan tops with different color sleeves. Choosing the sleeve color was the toughest part. The pattern is super easy and satisfying. When casting on, leave enough tail to sew sleeve/body the seam; when binding off each piece, leave enough yarn to sew up one raglan seam. The only mod I made had to do with gauge. La Laine is thinner than the Mezzotint; knit with the same needles, it has the same row gauge but less stitches per inch. 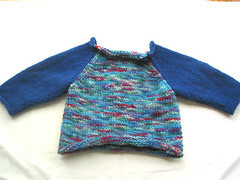 I added an extra increase for the sleeves (adding 2 stitches), and kept the rest the same. 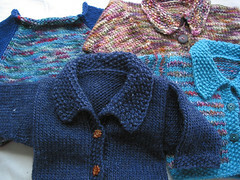 The next three are the Flax Jax baby cardi's. 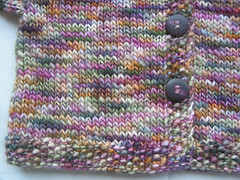 The pattern is easy; main mod was to leave out the seed stitch detail from the sides and back. 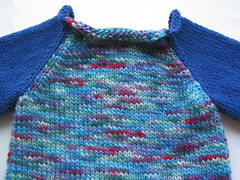 I liked knitting the body in one piece to the armpits, and picking up the sleeve stitches from the armhole: less aggravation later. The top button didn't look quite so good for me; I might change the buttonhole placement on future versions to include a bottom button and lower the top button. 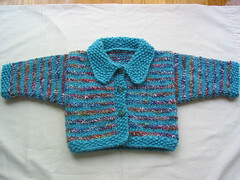 Notes: One of my first attempts to combine a handdyed yarn with something else. 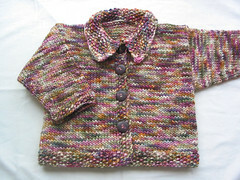 I love this little sweater! Notes: Simple with a slight sheen from the silk. Soft hand. Notes: Love this yarn! 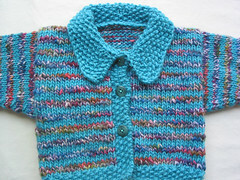 Knits up fast. Soft. Beautiful. 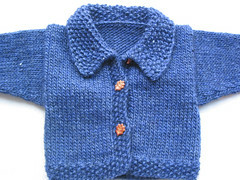 This cardi I'm stockpiling for when I have my own little bumble of joy. Only mod: picked up an odd number of stitches for the sleeve, instead of even; I liked the way the seam looked better in seed stitch over an odd number.